How to find a perpendicular line? If you want to quickly solve a problem in geometry, give this perpendicular line calculator a try. It finds the equation of a (yet undefined) line that is perpendicular to a given line and passes through a given point. Additionally, it calculates the coordinates of the intersection point of the two lines. All you have to do is input the coordinates of any point and the coefficients describing the given line, and our perpendicular line equation calculator will do the math for you! In this article, we will explain how to find a perpendicular line using basic principles of maths. We will also provide you with a simple example to illustrate how the method works. 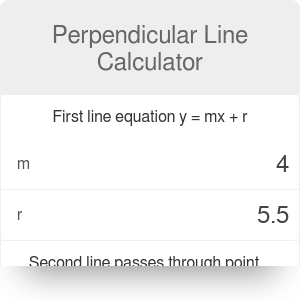 Make sure to check out the parallel line calculator, too! where a and b are coefficients, x is the x-coordinate, and y is the y-coordinate. Every line is uniquely defined if the values of a and b are known. The equation of the given line is y = mx + r. You know the values of m and r and are looking for a line perpendicular to this one. You also know the coordinates of the point your line is supposed to pass through. They are x₀ and y₀. Identify the slope (m) and the y-intercept (r) of the given line. In this case, m = 2 and r = -2. Don't believe it? Check the result with this perpendicular line calculator! Once you know the equation of the new line, finding the intersection point between it and the first (given) line is a straightforward task. All you have to do is find a point with coordinates (xₐ,yₐ) such that it lies on each of the two lines. Consider the example we've just analyzed. We found two perpendicular lines: y = 2x - 2 and y = -0.5x + 6.5. These two equations form a system of equations with two unknowns - the coordinates of the point of intersection. The coordinates of the point of intersection are (3.4, 4.8). Of course, you don't have to carry out these tedious calculations all by yourself - our perpendicular line calculator can do the same in just a few seconds! Perpendicular Line Calculator can be embedded on your website to enrich the content you wrote and make it easier for your visitors to understand your message.